An adult oyster can filter up to 50 gallons of water a day! Each year we grow over 100,000 baby oysters (spat) in the Baltimore Harbor. As an oyster volunteer, you will help us keep our baby oysters clean and measure their growth. This program runs from September through June when volunteers will have the opportunity to transport their mature oysters by boat to a Chesapeake Bay Oyster Sanctuary in the Patapsco River. Oysters grown in the Baltimore harbor are for restoration purposes only and not for eating. When would I help out with oyster restoration? Volunteer oyster gardening happens on two Saturday mornings each month September through June. Sign up to receive the latest information on upcoming oyster gardening opportunities. Alley makeovers are an innovative twist on your typical neighborhood cleanup event. They combine alley cleaning with artwork and inspirational messages about the fundamental connection our neighborhoods have to our streams and Harbor. Volunteers can help by removing weeds and litter and by painting storm drains and street murals. When would I help out with an alley makeover? Alley Makeovers typically occur on the first Saturday of every month, March through November. Sign up to receive the latest information on upcoming alley makeover opportunities. The Waterfront Partnership creates fun activities and special events for all ages. We also manage Baltimore’s waterfront to welcome, beautify and offer a fun place for families. 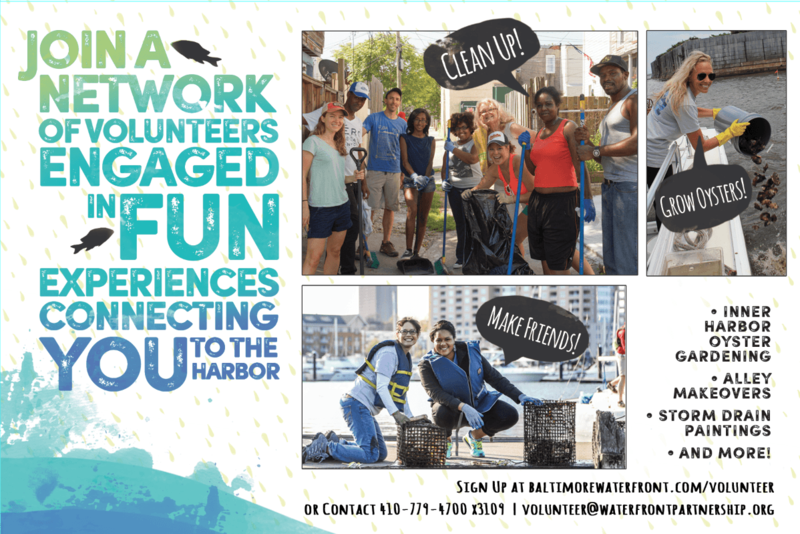 As a volunteer, you will have the opportunity to get involved with special events by promoting Healthy Harbor at waterfront events like Light City, Summer Socials, the Great Baltimore Oyster Festival, and more! When would I help out with waterfront events? Volunteer opportunities at waterfront event occur throughout the year. Sign up to receive the latest information. Healthy Harbor advocates work to influence public policy related to pollution, city infrastructure and environmental hazards. Interested volunteers can write letters to the editor, circulate petitions or help organize rallies to influence positive environmental change in Baltimore and Maryland. When would I help with advocacy? Sign up to be notified when advocacy actions are needed.